Friends, I have exciting news! 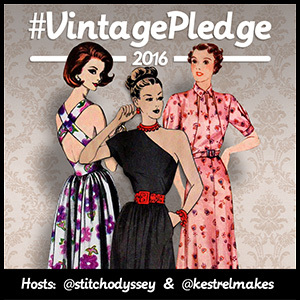 #VintagePledge is back for a third year running, thanks to the support of my wonderful co-host Kestrel Makes, and thanks to your growing enthusiasm. 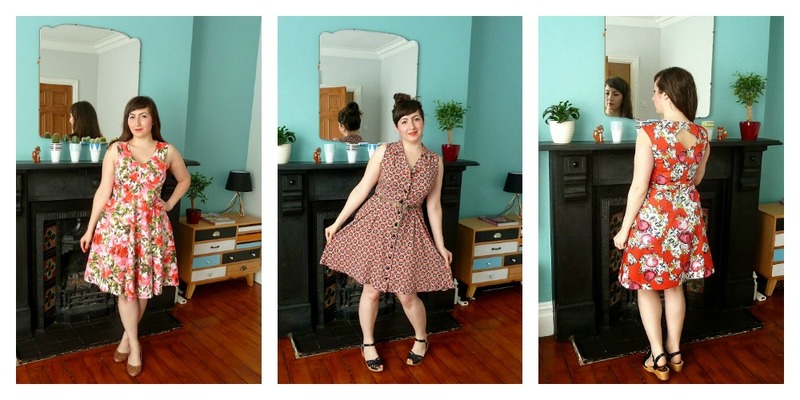 If you’re unfamiliar with the pledge, it all started in 2014 when I realised I was hoarding vintage patterns faster than I could sew them. 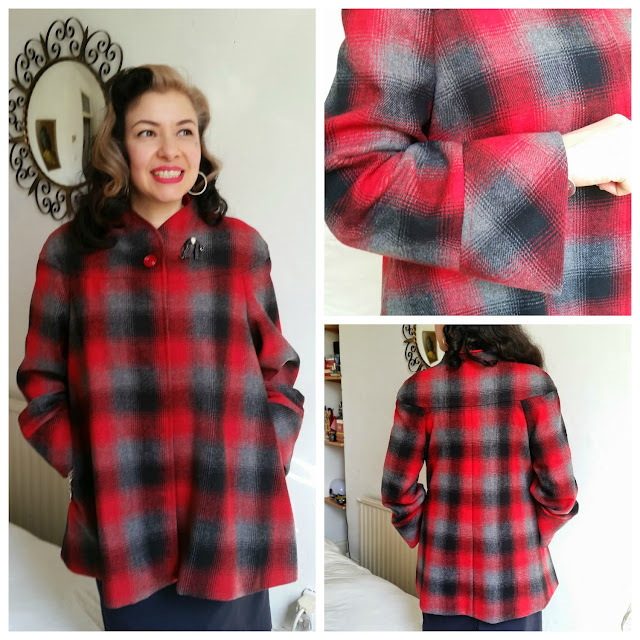 To rectify this I invited you to join me in using vintage patterns more regularly and last year over 200 of you did so, sewing up more than 400 makes between us! Those figures are double what they were in 2014, so let’s make 2016 even bigger! 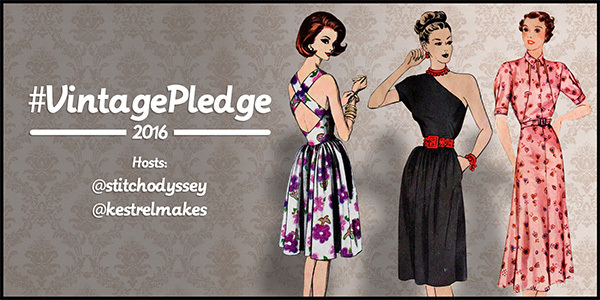 We’re changing things up a little this year, but rest assured that #VintagePledge 2016 will still be fun and fabulous! As always, the pledge will run all year with grand prizes at the end for a select few. Instead of a monthly schedule, we’ll be dedicating one solid month to Vintage Pledge activity in July! This will include daily contributors sharing their vintage-inspired makes, as well as daily photo prompts on Instagram for the chance to win cool prizes. We’ll be keeping the momentum going throughout the year with round-ups and highlights of your makes, using #VintagePledge across social media. Full details will be shared nearer the time, but in the meantime make sure to save the date! 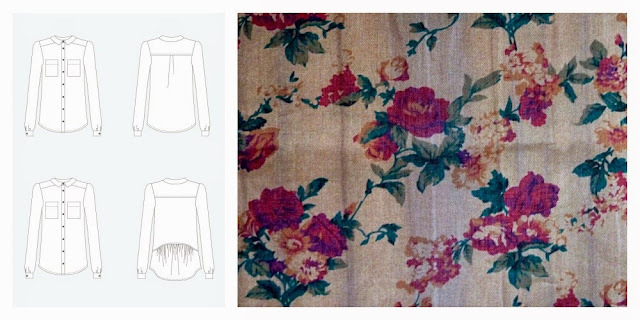 Your pledge can be as specific or as flexible as you like, the only ‘rule’ is that you must use vintage or reproduction patterns. 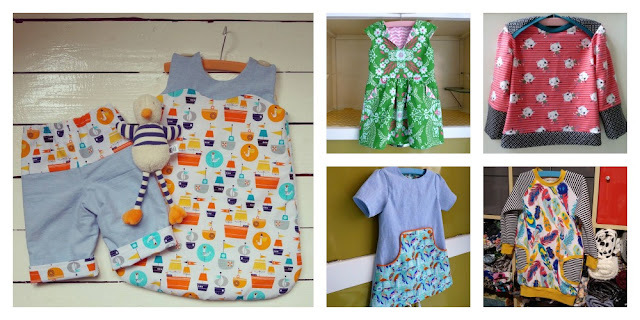 You can sew as many or as few items as you like. You may want to choose one or two if you're new to vintage and/or sewing, or create a whole vintage-inspired wardrobe. 1990s patterns are eligible for the pledge as they’re over 20 years old, which makes them vintage by definition…sorry! As well as genuine vintage patterns, we’re allowing reproduction patterns too. It's not just about dressmaking for you or the special people in your life (kids, partners, etc)! You can also join in if you like to sew accessories, toys, homeware and so on. Make the pledge your own! 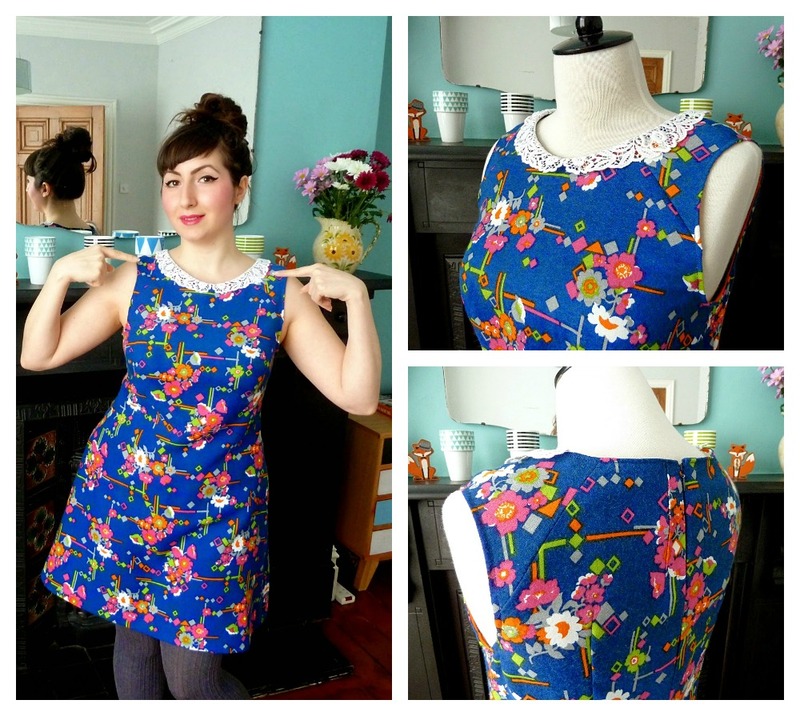 There are many ways to do this, for example by pledging to use your first ever vintage pattern, sewing up a specific pattern from your stash, exploring patterns from a particular decade or setting yourself a numerical target. Knitters are welcome too! The same criteria applies. Use #VintagePledge when sharing projects across social media. As in previous years, we’ve set up a dedicated Pinterest board to show off your makes and inspire others. Our end-of-year prize winners will be chosen from this board, so make sure you share your finished projects with to be in with a chance. If you’re on Pinterest, you can add your own makes to the board, but please stick to just one picture per project! To pin your own you need to first follow the dedicated board, then request permission to pin by letting me know your Pinterest name - the name that displays at the top of your Pinterest page when you log in (usually your real name) and not the user name that appears as part of your Pinterest board’s URL. 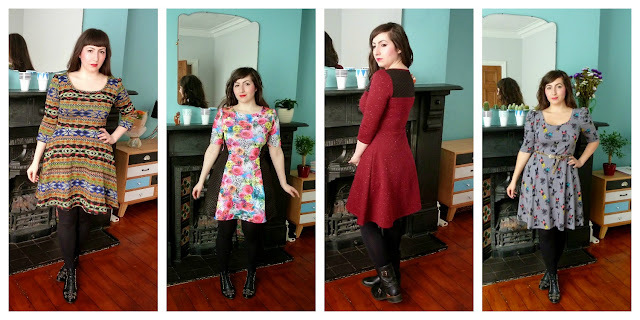 Alternatively, you can send us photos of or links to your makes and we’ll pin them for you. To request permission to pin your own, to ask me to pin for you, or if you have any questions you can leave a comment on my blog, email me on astitchingodyssey[at]hotmail[dot]co[dot]uk, or contact me on Twitter or Instagram - don’t forget to include #VintagePledge. You can also contact Kerry through Kestrel Makes, via email kerry[at]kestrelmakes[dot]com, or on Twitter and Instagram. 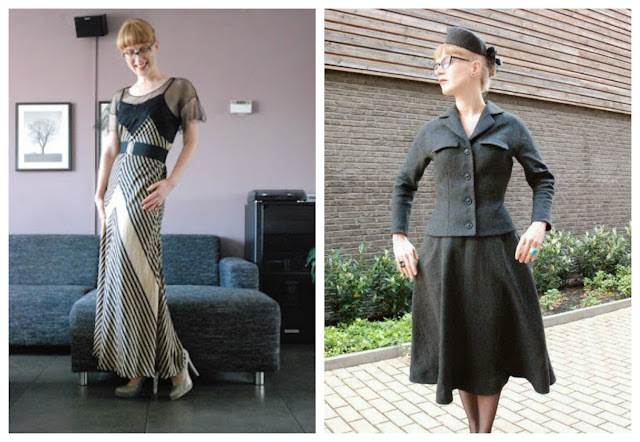 During 2016, I, Marie Koupparis, pledge to tackle some of the older vintage patterns in my stash, especially from the 1940s and earlier. Are you in? If so, grab a button (beautifully designed by my Charlotte), spread the word and start stitching vintage! 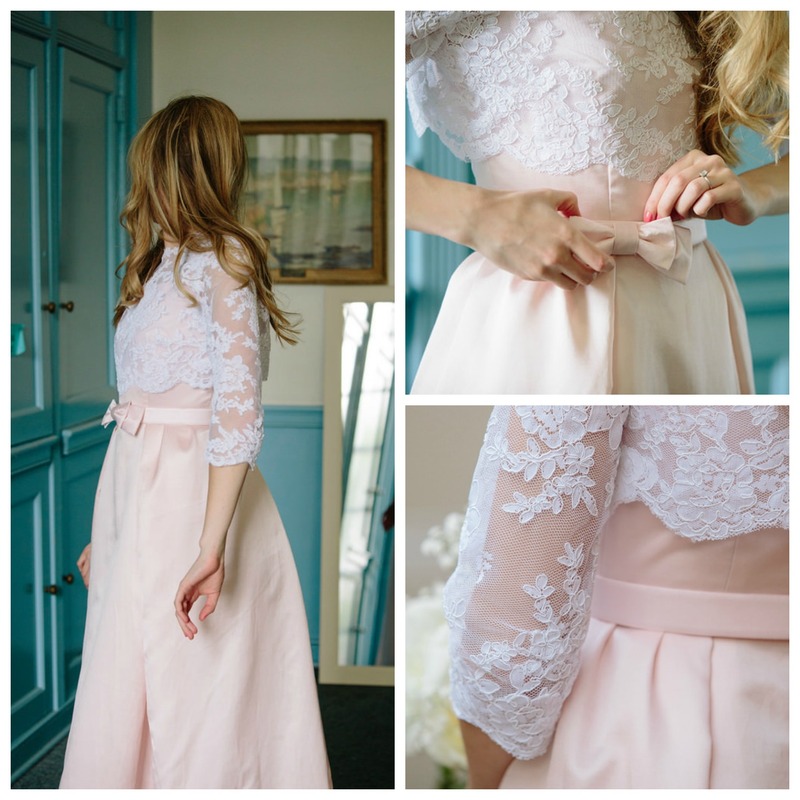 Allie J for her beautiful wedding dress! There were a lot of entries in this category with a great representation of different decades. But it's tricky to beat someone who has made a beautiful silk and lace dress for arguably the biggest event of their life. Congratulations Allie, you win a £100 voucher to spend online at Minerva Crafts. Tasha for her cropped top! This top is a double whammy - a restyle from a shirt as part of The Refashioners challenge that uses a vintage McCalls pattern. Tasha has turned a huge man's shirt into a fun crop top. Congratulations Tasha, you win a £50 voucher to spend online at Remnant Kings. 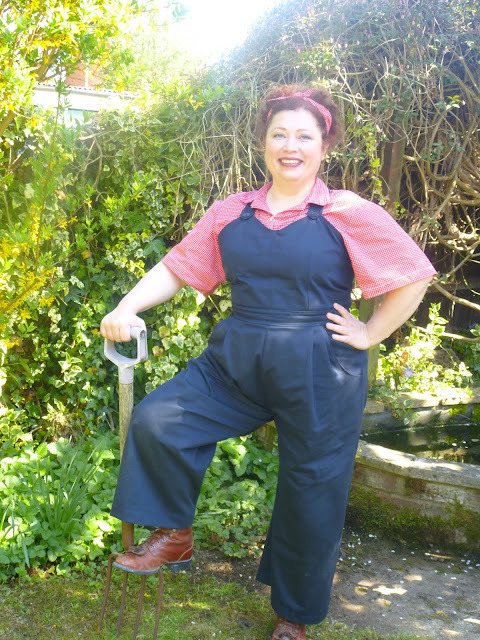 Carmen for her Rosie the Riveter dungarees! This category was dominated by jumpsuits and playsuits but Carmen's gorgeous dungarees were a huge hit with all the judges. Congratulations Carmen, you win a £50 voucher to spend online at Abakhan. Nicole for her Plaid Swing Jacket! There were some really strong entries in this category too, but Nicole's pattern matching skills gave this jacket the winning edge. 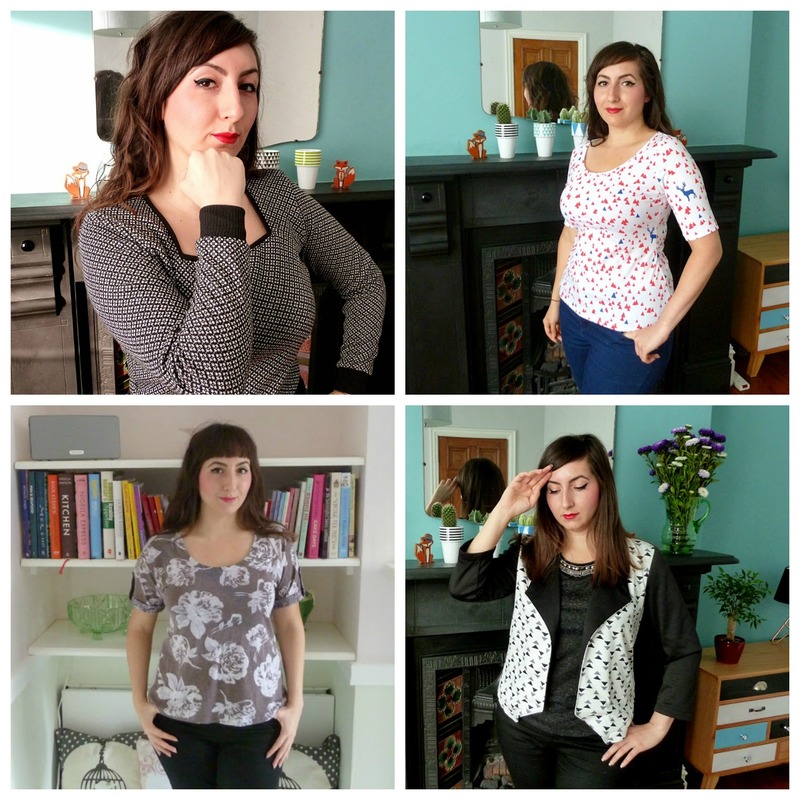 Congratulations Nicole, you win 5 Simplicity Reproduction patterns of your choice and a year's subscription to Love Sewing magazine. Lauriana made a stunning 1930s dress which was really popular with the judges, as well as drafting a gorgeous 1950s style suit. She was really committed to the pledge and a well-deserved winner. Congratulations Lauriana, you win a $20 credit to spend online at Adele Bee Ann patterns and £25 voucher for The Village Haberdashery. If you're one of our lucky winners, please email Kerry at kerry[at]kestrelmakes[dot]com to claim your prizes! 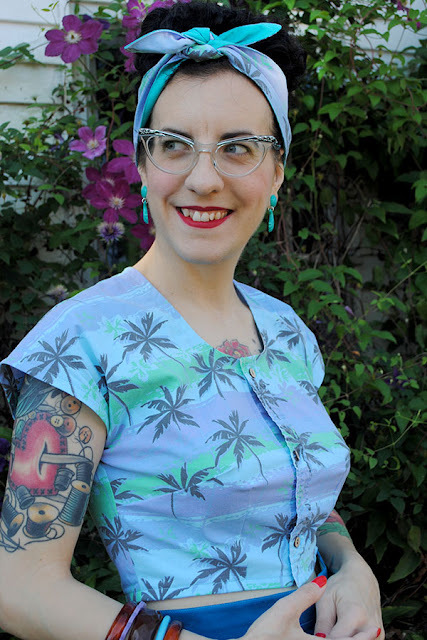 I bet the unveiling of our winners has left you feeling inspired to get busy with your vintage patterns, eh? 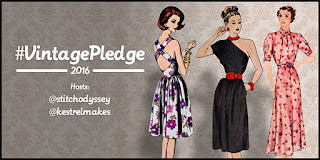 Well, Kerry and I will be announcing plans for the Vintage Pledge 2016 before the end of the month - so watch this space! Finally - a big thanks to our generous sponsors for the end-of-year prizes! A special thank also to all of our sponsors throughout 2015, who offered up giveways, offers and discounts. Happy New Year, friends! 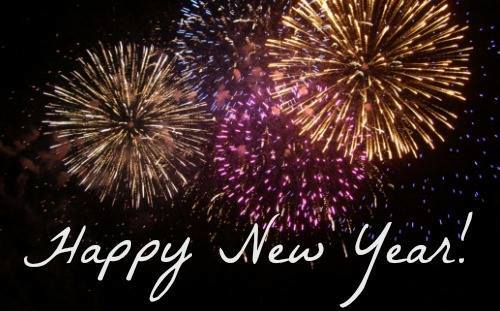 Wishing you all a happy, healthy and stitchy 2016!!! I don't know about you, but 2015 was a pretty challenging one in many ways, both personally and work-wise. The love and support of family, friends and the sewing community got me (and Charlotte) through though, as well as the physical and rewarding act of sewing of course! With an idea of the challenges that lay ahead, I had enough foresight to set myself realistic 'resewlutions' for 2015, which I always find interesting to reflect back on at this time of year. I was only 50% successful on this front, but my psychedelic Francoise turned out pretty rad if I do say so myself! I still really want to make my floral, gathered-back Archer though, so here's hoping I get around to that this year. Well, there's no denying I had my planned fun with knits, is there? And I'm not about to stop, as I can't get enough of comfy clothes! I wanted to explore full skirts that weren't gathered and I'm so pleased with the results. I'm looking forward to more pretty dresses to fill my wardrobe with! As usual, I had heaps of fun sewing for loved one's kids, who are growing up mighty fast! I've revisited tried and tested patterns, and have discovered some lovely new ones too. 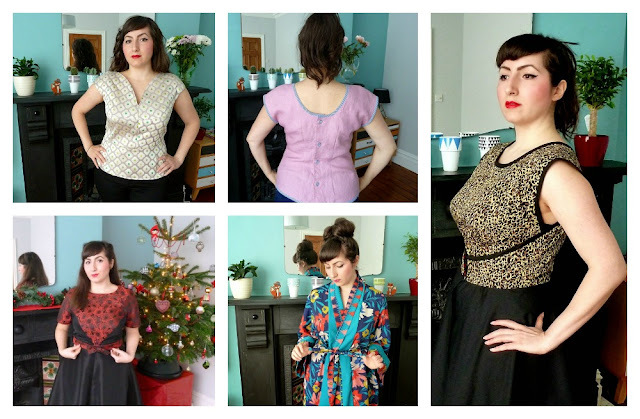 Just in the nick of time, I managed to complete my #VintagePledge to sew up five garments using the vintage patterns in my stash. It may not sound like much over the course of the year, but with the time-consuming fitting adjustments required for each make, I'm pretty thrilled with my result! More #VintagePledge of course! Kerry and I are currently finalising plans, as the pledge will have to take a slightly different (but still very fun) format in its third year to fit in with our various commitments. Other than that, I'm not setting myself any 'resewlutions' for 2016. I know I want to sew even more knits and pretty dresses, that I need cute tops to wear with jeans, that I'd like to challenge myself a little (maybe by making jeans or coats) and that I want to tackle some of the older vintage patterns in my stash. But I also know that Charlotte and I face many more challenges this year (including a trip for surgery in South Korea this month), as well as exciting plans to renovate more of our house. So I just want to play it by ear, not stress myself out and just enjoy the creative projects I get stuck into. How about you? Do you enjoy a good reflection? What are your goals for 2016?